Have you deleted your Gmail contacts mistakenly? Or lost your Gmail contacts data accidently? Now you won't have to worry about your deleted Gmail contacts. Now you can recover and restore your Gmail Contacts easily without any problem. Google is now offering to Gmail users reverse any changes they have made to their Gmail contacts over a 30-days time period. That’s mean if you have deleted your Gmail contacts or have made any changes to your Gmail contact list within the past 30 days, you can go into your Gmail account and restore the desired version of your contacts list according to your preference. This new feature will also come in handy if you’re trying to switch devices and sync contacts but accidentally end up deleting contact information from your Gmail account. 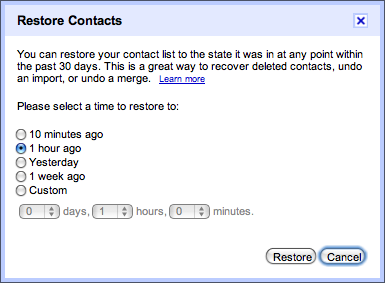 When you select a time frame, all of your Gmail contacts will be restored exactly as they were at that time. Any new contacts you’ve added since then won’t exist, and any contacts you had deleted will be back again. You can also undo a contacts restoration, if you like.